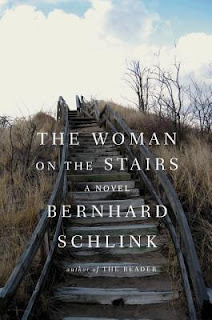 Bernard Schlink is most well-known for his novel The Reader, which admittedly, I have never read. His newest novel, The Woman on the Stairs is a highly anticipated release, and tells the story of a painting which reappears in a gallery in Sydney after having disappeared decades before from the home of a German businessman. Our narrator, an unnamed German lawyer, stumbles across the painting while he is in Australia on business, and feels compelled to track down the woman whom he is sure is the unnamed patron who has donated the piece. He is right. His searching leads him to Irene, both the subject of the painting and the woman who stole it, many years before, with the narrator's help. She has placed the painting in the gallery in the hopes of luring both the painting's former owner and the painter himself to her secluded island home, to see them both one more time. Schlink is a master wordsmith-- that much is apparent to me-- but as I read this novel I was struck by the fact that this simply wasn't enough. The narrator tells the story in an odd, distanced fashion, which at times was blatantly repetitive, and which allowed me to neither feel as if I knew him nor his subjects. For a novel which was inherently character driven, this proved to be a problem, as I realised increasingly that I did not care for any of the characters. I was also frequently confused by the shifting between times, and the large tracks of text which were actually characters relaying stories about pasts of imagined pasts. Indeed, the majority of the book's third act shows our narrator telling stories to Irene about what their life could have been if they had become a couple all those years ago. While I believe the rules of writing are there to be broken, show don't tell does serve the purpose of allowing your reader to be in the moment with you as they read along, and that was certainly missing from this book a lot of the time. I wondered if perhaps this was due to the book having been translated from German, or if perhaps this simply wasn't a book for me. A small item of nitpicking too was the character's name-- when he discovers her whereabouts, Irene is living under her maiden name, Adler. Yes, Irene Adler. Which happens to be the name of a character from the Sherlock Holmes novels. Sure, it could very possibly also be the name of a lot of people worldwide,but it leaves me to wonder if this was a deliberate reference. If so, the similarity stopped there and I failed to see the point. There have been so many books out lately which use the central plot point of a missing work of art resurfacing in an unlikely place-- to name a few I can think of Jessie Burton's The Muse which I enjoyed, and The Last Painting of Sara de Vos which I could not get into. For such a well-trodden path, I think I expected more from this novel, but I would not be put off reading Schlink again if the subject matter interested me because he has certainly shown that he could write. Overall, I found the lyricism of the prose beautiful but it wasn't enough to redeem a book which hung a fairly flat story onto the backs of mediocre characters. Unfortunately this was not for me, and I have to disagree with the many readers out there who have been raving about this one. I gave it 2 stars out of five.